As a medical professional, you know firsthand the lifesaving difference blood donation makes for patients undergoing surgery, cancer treatment, or blood transfusions. But, chances are good with your busy schedule you probably haven’t taken the time to donate blood in a while. So, in honor of World Blood Donor Day on June 14, we’ve put together 4 facts we hope will inspire you to participate in a blood drive in your area this week. Every 2 seconds in America, someone receives blood from the generous donation of the 6.8 million people in the U.S. who donate blood. However, the blood supply does not always meet the need since only 10% of eligible blood donors volunteer to donate blood. Donating blood doesn’t just benefit the health of those who need blood. It’s healthy for the donor too according to several different studies. Researchers have found that those who donate blood 1 to 2 times per year have a reduced risk of heart attack and cancer and are more likely to maintain a healthy weight, avoid premature aging, and have more balanced iron levels. In the U.S. approximately 45% of people have either O positive or O negative blood type. Since so many people fall within those two blood type categories, demand is usually high for O donors. AB positive donors are also in high demand for the opposite reason. Only 3% of people in the U.S. have AB positive blood, however, AB positive plasma can be transfused to patients of all blood types, which increases the demand for it. 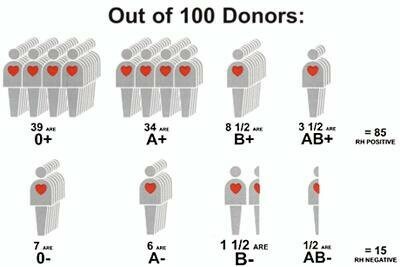 Here’s a quick breakdown of how many people in America fall within each of the different blood type categories. It typically takes just one hour from pre-screening to post-observation to donate one pint of blood—with the actual blood donation taking only 8 to 10 minutes of that time. But, did you know that taking the time to donate just one pint of blood could save up to 3 lives? For more facts on blood donation and to learn about World Blood Donor Day, visit the World Health Organization’s website.